Motherwell boss Stephen Robinson was happy after his side battled back to beat Hamilton Accies 2-1, one day after he’d signed a contract extension to May 2020. 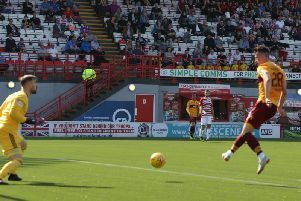 Robinson, whose ’Well side are now fourth in the Scottish Premiership, said: “I didn’t really think it was going to be one of those days when Accies scored first. We’ve got a group of boys that don’t give up. “We say to them that whatever the result is, you do the same thing. ’Well are now gearing up for a massive Betfred Cup semi-final against Rangers at Hampden Park this Sunday. “We’ve got a chance to get to the final,” Robinson said. “Which is a great opportunity for us and hopefully one we can take. “We’re confident going into the game as they will be.